Reviewing recent photos confirmed what my senses told me – that when the angelica came up this year it veritably exploded from the ground! One week it was a relatively small hummock of leafy growth, eight days later it had grown a couple of feet and was bearing flowers. Another couple of weeks on and it was about my height! I know this is the time of year when gardens are exploding with growth, but mine seems to have even more energy than normal. 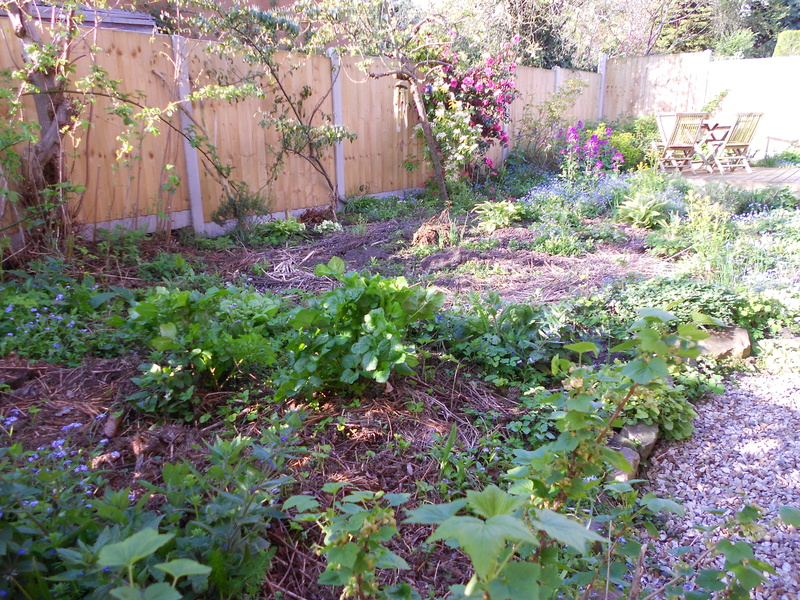 This photo shows the garden on 16 April 2014. The angelica is part of the hummocky greens in the lower middle ground. And this shows it eight days later on 24 April 2014. By 12 May the whole garden is transformed! Much of what is visible is early spring flowers that bring a wealth of bloom and attract plenty of insects. They will soon be gone (having generated lots of biomass to feed future fertility) and there will be space for more edibles. 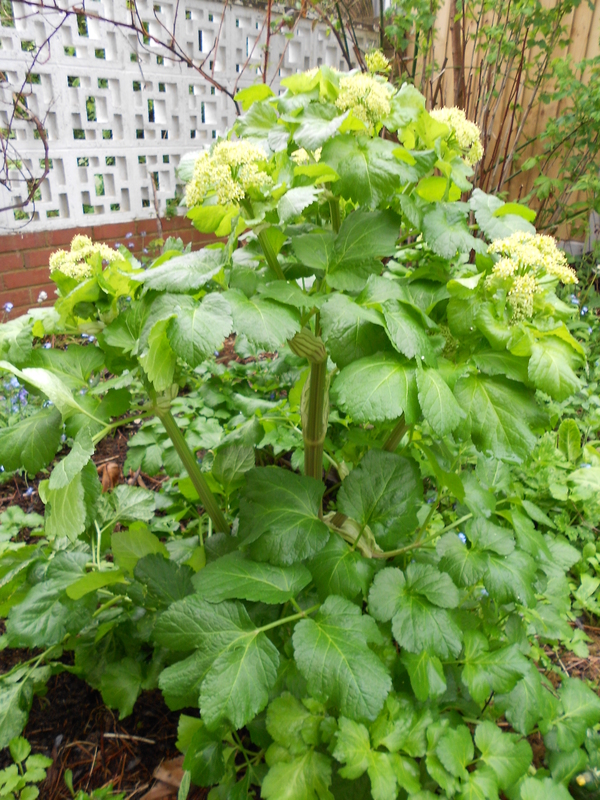 I bought the angelica years ago from a garden centre as a diminutive looking herb. I knew it might get quite big, but not this big! I have never used any part of it but am happy it is there for the insects and also for the biomass it generates. I have just checked the entry on the Plants for a Future database and found out all parts are edible, so I should make more effort and use it. Anyway I like it so much that I have bought another plant for the Borderland garden, where I plan to plant it in the hedge, hoping it will help fill up a bit of a gap. Plants for a Future says it is normally biennial but can be reliably perennial if prevented from setting seed. I usually set it back by removing flowering heads and it comes back year on year. Last year I let the seeds ripen, which was a big mistake as it generated approximately a trillion tiny seedlings. However I despatched almost all of these by covering them with an ultra massive dose of mulch from the compost bin and also some ‘slabs’ of upturned bedstraw from another bed which had got equally out of hand. After a couple of weeks the bedstraw ‘slabs’ had almost completely decomposed into a dark brown mulch. I was surprised they had done this so fast, but checked my notes to verify the dates. I have noted before that plants left to decompose on the soil surface disappear remarkably quickly which I am putting down to very active micro organisms. 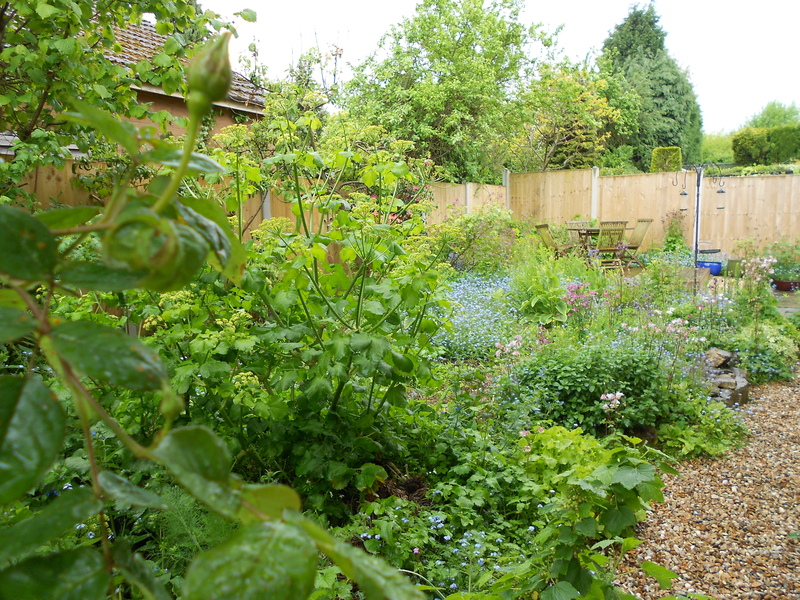 This entry was posted in Forest Gardening, Hedgerow, Herbs, Permaculture, Polycultures, Telford Garden. Bookmark the permalink.